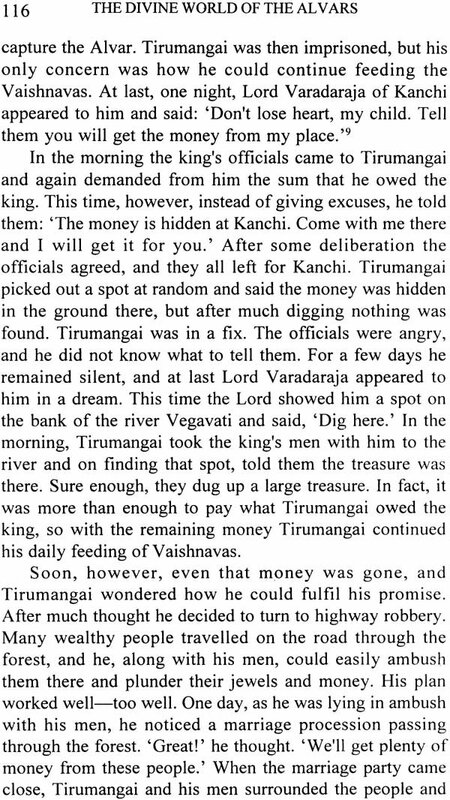 Between the sixth and ninth centuries a group of Vaishnava saints appeared in South Indian who, through their lives as well as their songs, completely changed the religious life of India. 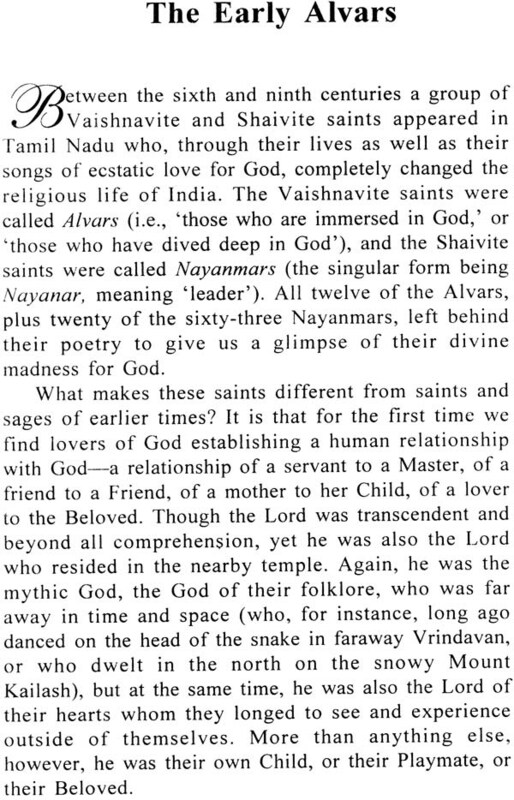 Like the sages of ancient times, whose deep spiritual experiences recorded in the Vedas became the foundation of most of Indian philosophy, the Alvars also revealed their spiritual experiences in their songs and thus inspired a new path towards God -one of ecstatic love. 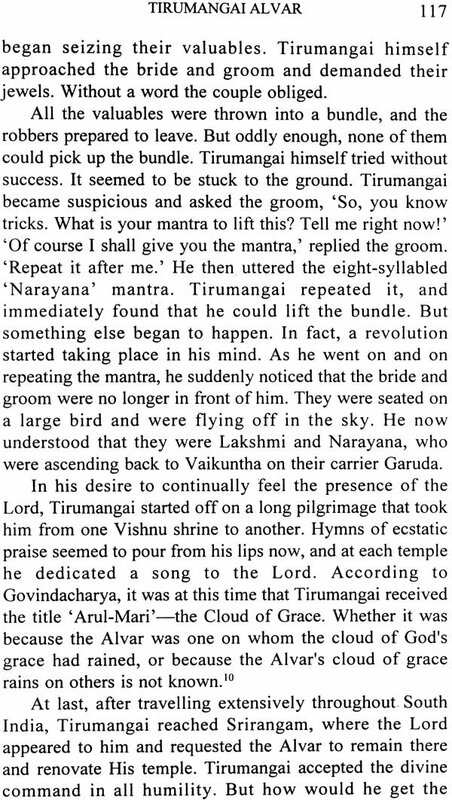 Their love was for Vishnu in all his aspects. He who was the Lord of Vaikuntha was also the Lord in the temple, and again it was He who dwelt in their own hearts. But more than anything else, He was their own Child, or their Playmate, or their Beloved. These saints were possible the first to establish an intimate human relationship with God and realize Him through intense longing. The Divine world of the Alvars presents the lives and songs of these saints, and gives a glimpse into their world of Devine love. India has an old and vast cultural and spiritual heritage, and all parts of the country have contributed to this heritage. As part of the Ramakrishna Mission Institute of Culture's research work on India's contribution to world culture, the Institute Bulletin has been publishing a series of articles on Indian saints by Pravrajika Shuddhatmamata (Cecile Guenther). 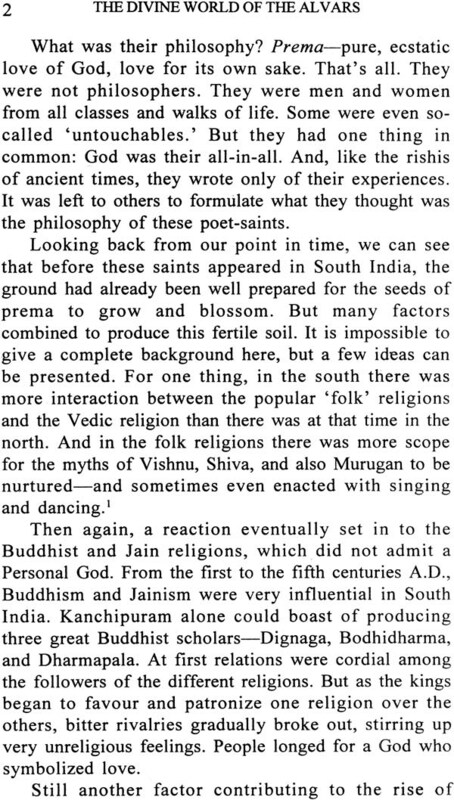 The first eight articles of this series, published between September 1998 and November 2000, were on the Alvars of Tamil Nadu, and were well received. At the request of readers we are now publishing these articles in the form of a book, The Divine World of the Alvars. While preparing this book for publication the author has included some additional material here and these, as well as many more songs. We believe the readers will enjoy this volume.